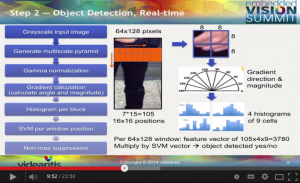 At the May 2014 Embedded Vision Summit West, our Marco Jacobs presented the “Implementing Histogram of Oriented Gradients on a Parallel Vision Processor” tutorial. The video is now available on the Embedded Vision Alliance website, after a quick email registration. Object detection in images is one of the core problems in computer vision. The Histogram of Oriented Gradients method (Dalal and Triggs 2005) is a key algorithm for object detection, and has been used in automotive ADAS, security and many other applications. In this presentation, we give an overview of the algorithm and show how it can be implemented in real-time on a high-performance, low-cost, and low-power parallel vision processor. We demonstrate the standard OpenCV-based HOG with Linear SVM for Human/Pedestrian detection on VGA sequences in real-time. The SVM Vectors used are provided with OpenCV, learned from the Daimler Pedestrian Detection Benchmark Dataset and the INRIA Person Dataset. Watch the video on the EVA website.